For the first time in the US, the Choir of the “Tempio Maggiore” conducted by the renowned tenor Claudio Disegni and featuring the hazan of Rome, Alberto Funaro, and organist Federico del Sordo, will expose the New York public to the unique flavors and variations of the liturgical tradition of the Jews of Rome. Welcome remarks by the Consul General of Italy Francesco M. Talò and Dr. Giacomo Moscati, Representative for International Relations of the Jewish Community of Rome. The concert will open with Giuseppe Verdi’s “Và Pensiero,” the Hebrew Chorus from Nabucco. This magnificent choral work, which has become a symbol of the unification of Italy, recalls the story of the Babylonian exile after the destruction of the First Temple. The program will also include unique examples of late 19th century compositions from the Jewish communities in Florence, Livorno, and Rome as well as a 1920 version of Hatikvà by Armando Sorani based on the 17th Century ballade La Mantovana. Maestro Claudio Di Segni studied music at the Rome Conservatory S. Cecilia where he currently teaches. As tenor he trained with the legendary Franco Corelli, among others. He received important awards for his opera roles including Riccardo in Verdi’s Ballo in Maschera, Edgardo in Lucia di Lammermoor, and the Duke of Mantua in Rigoletto. Rabbi Alberto Funaro is the hazan of the Tempio Maggiore and of the Tempio Spagnolo of Rome. He has recorded several CDs of Roman and Sephardic liturgical music. Maestro Federico Del Sordo studied organ, piano, composition, and conducting at the Conservatory of Santa Cecilia in Rome, where he is currently a professor of organ and harpsichord. He also teaches at the Pontificio Istituto di Musica Sacra di Roma. A renowned organist, he regularly appears in concert at major Italian and European venues. Francesco Spagnolo, Ph.D., is the Curator of The Magnes Collection of Jewish Art and Life at the University of California, Berkeley. In 1997, he founded the Jewish music archives in Milan, and between 1998 and 2002 was responsible for the preservation and publication of Italian Jewish sound recordings at the Ethnomusicology Archives of the National Music Academy in Rome and the National Sound Archives in Jerusalem. This concert is presented by Centro Primo Levi and the Museum of Jewish Heritage as part of Divinamente NYC Festival. Download postcard. The third annual DIVINAMENTE NYC festival will take place from May 19th through 22nd 2011. Founded by renowned Italian actress Pamela Villoresi (artistic director), the festival celebrates the spiritual dimension of the arts and their ability to bridge across national boundaries. On the 150th anniversary of the unification of Italy, artists from different backgrounds have been invited to reflect upon the idea of “home”. Home by birth or by choice, the one we live in or the one we imagine and pursue. The festival is sponsored by the Italian Ministry of Culture and the Italian Cultural Institute of New York. This program is presented in collaboration with the Italian Cultural Institute of New York, the Jewish Community of Rome and the American Society of Jewish Music. It is made possible through the support of the Italian Ministry of Foreign Affairs on the 150th Anniversary of the unification of Italy. The programs of Centro Primo Levi are made possible through the generous support of the Cahnman Foundation and the Viterbi Family Foundation. Scola Nova Italiana, Centro Primo Levi and the Jewish Community of Rome are pleased to offer a special Qabbalat Shabbat in the Roman rite conducted by Rav Alberto Funaro and Rav Umberto Piperno with the participation of the choir of Rome’s Tempio Maggiore and a member of the Board of the Jewish Community of Rome Dr. Giacomo Moscati. The event is generously hosted by Mr. Peter Kalikow. Centro Primo Levi and the friends of the Italian Jewish Communities in New York are grateful for his hospitality and continuous support. The Choir of Rome’s Tempio Maggiore represents one of many gems in the cultural tradition of the Jews of Rome, dating back the the ghetto era when – under Papal rule – the different Jewish communities that for centuries had coexisted in the city were forced to cohabit the building of the Cinque Scole. The Choir, that once counted over 30 among men and boys, is today formed by 11 members directed by the renowned tenor Maestro Claudio Di Segni and accompanied by the organist Maestro Aldo Spizzichino whose musical lineage is tied to the history of the community. Mr. Di Segni and Mr. Spizzichino inherited the massive work of reconstruction of Maestro Elio Piattelli who, between 1947 and 1984, relentlessly worked to keep alive the musical knowledge of the older chazzanim, whose world had been destroyed by the Fascist and Nazi persecution. Maestro Piattelli’s transcriptions of Roman chazzanut documents layers of history and cultural influences that, in the 19th and early 20th century, formed a true musical melting pot. The Roman Jewish rite, Italki o Bené Romi, is considered by many one of the oldest in the Diaspora and the only one with a direct link to the Temple era. Among the most recognizable traits of their liturgy, Roman and Italian Jews have preserved a uniquely composed version of Arvith shel Shabbat (evening prayer of the Sabath), which Rabbi Samuel David Luzzatto (Shadal) considered as originating in an ancient poem. Another departure from the better known Sephardic and Ashkenazi traditions is represented by the main prayer of the holiday of Yom Kippur (Day of Atonement). While Jews around the world recite the Aramaic version of Kol Nidré, Roman Jews have for 20 centuries cantillated the Hebrew version of Kol Nedarim which predates the Babylonian canon. Finally, the Ygdal Elohim Hai, poetic presentation of Maimonides’ principles of faith, was composed by the Roman 13th century rabbi, Daniel Ben Yehudah Dayan min Anavim. The Roman rite is currently followed in most Jewish communities in Italy and in the Italian synagogues of Jerusalem and Ramat Gan. 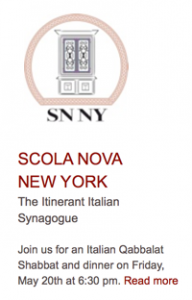 It is making its appearance in New York through the events of Rabbi Piperno’s itinerant Scola Nova.